SC@M were awarded an SSAF grant by University of Melbourne to host a series of one-day workshops. Aimed at both our cohort and students from other arts-focused faculties, the workshops were designed to develop networks between fellow graduate students, increasing materials handling skills, and meeting and learning from artists and conservation industry professionals. We've been lucky to learn from some of the industry's best! Each workshop had a theme and involved two sessions – artistic and conservation focussed. Our first workshop was ceramics. Leading contemporary artist and conservator Penny Byrne and ceramicist Chela Edmunds of Takeawei led students wielding clay, hammers and Paraloid B72 to build clay vessels and consolidate of smashed porcelain tiles. The painting workshop featured international paintings conservator Sabine Cotte and contemporary artist Kez Hughes showing us the art of infilling, inpainting and colour theory. Working with both oils and acrylics we tried our hand at these colourful and definitely tricky skills! 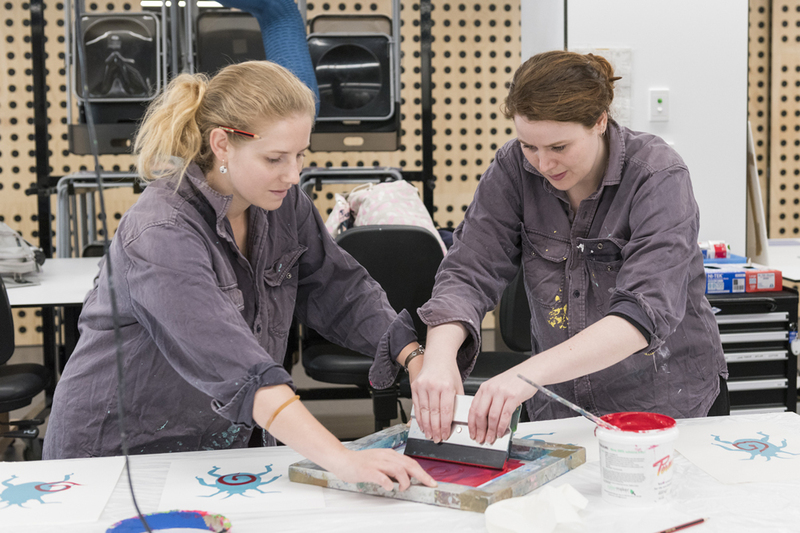 For the paper workshop, students created and screen-printed their own design with Home-Work ladies Lara + Jess, to see how different paper types and textures affected the prints. With paper conservator Peter Mitchelson, we tried our hand at mounting postcards with Japanese hinges and wheat starch paste. At the textiles workshop with designer Roz Slade and conservator Marion Parker taught students how to dye a silk scarf using immersion and direct application techniques. We used natural dyes on wool, cotton and silk, plus learnt the best conservation methods for storing clothing. A fun, social activity, there were a great mix of students from the University of Melbourne cultural materials conservation, curatorship, arts management, heritage, and contemporary art courses. SC@M hope to develop this successful pilot program for a new series in 2018. Big thanks to the Grimwade Centre for their support, and University of Melbourne for funding through the Student Services Amenities Fee (SSAF) grant.